I recently spent the day giving a First World War workshop to Year 6 pupils at Orchid Vale Primary School in Swindon. During the morning I spoke about my job and the variety of roles I perform. After that brief introduction I spoke at length about the wartime life of a typical British soldier, kit, food and the daily routine of trench warfare. Having brought along some German barbed wire found last year when walking on the Somme, I was able to show them the length of the barbs. We then spent some time talking about local Swindon men who went off to war. Having used Mark Sutton’s excellent ‘Tell Them Of Us’ book all about Swindon’s war dead, I had identified a number of characters that I knew would interest the children. One of these men was Second Lieutenant Frederick Wheatcroft, a Swindon town footballer who was killed at Bourlon Wood during the Battle of Cambrai in November 1917. 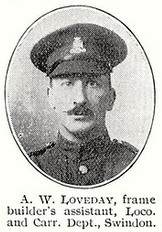 Another was a former GWR employee, Arthur William Loveday who had won the first of his two Distinguished Conduct Medals in a daring raid on the German trenches at Ploegsteert Wood in December 1915. We also looked at Swindon men who had gone to Canada before war started as so fought in the Candian Army. The afternoon was spent visiting Swindon’s main war memorial. On arriving at the Cenotaph at Regent Place the children all had a good look at the memorial, reading John McCrae’s famous poem ‘In Flanders Fields’. We then headed inside to the former Town Hall, now occupied by a dance studio. 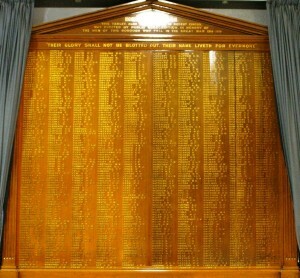 Hidden behind curtains is the hugely impressive wooden war memorial, listing over 900 of Swindon’s men who were killed during the war. The children were very keen to look up the names of the men that we had discussed earlier. They also found names that were familiar to them and we looked up their details in Mark Sutton’s book. Our visit concluded with the singing of wartime songs beefier we headed back to the school. We all agreed it was a great shame that the memorial was hidden from public view. Fran Randall, the teacher who had invited me to Orchid Vale is Swindon born and bred and yet had no idea about the memorial. Ironically, the memorial was paid for by public subscription but is not available for the public to view. For more information about Swindon in the Great War follow @SwindonGreatWar on Twitter. I had a wonderful day at Orchid Vale, spent with inquisitive children and friendly staff. 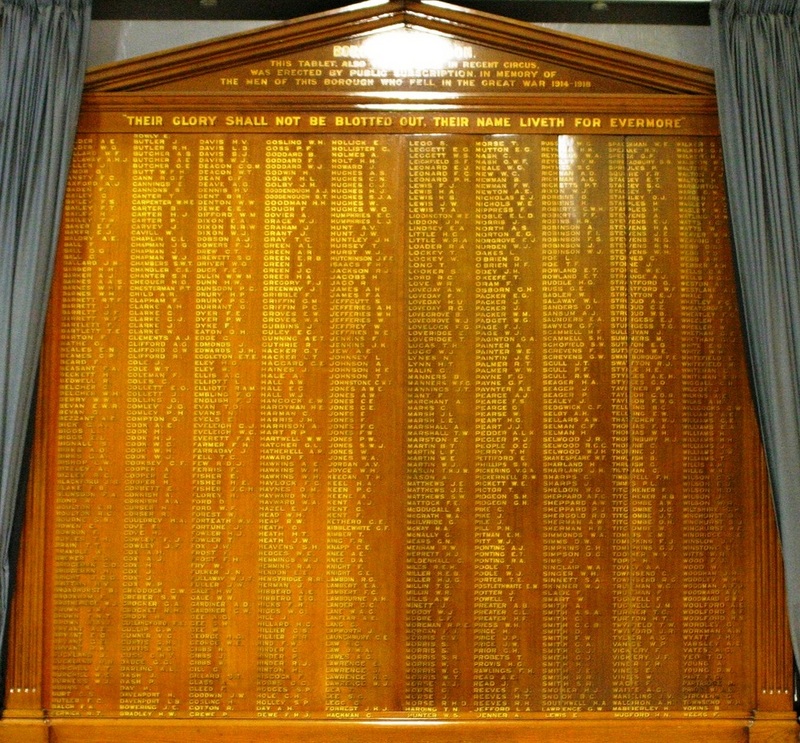 I hope their interest in the war continues, in particular their efforts to help the campaign to find a more suitable place for the town’s magnificent war memorial to be displayed. This entry was posted on Monday, February 24th, 2014 at 10:05 am	and is filed under Miscellany, Schools. You can follow any responses to this entry through the RSS 2.0 feed. You can leave a response, or trackback from your own site.